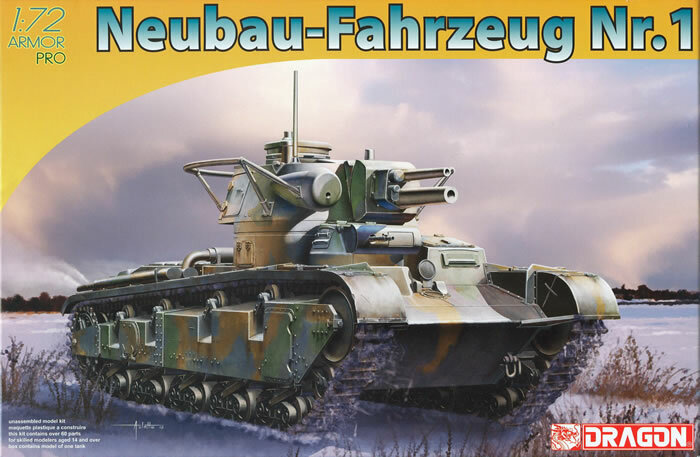 Following up on their 1/72 scale Neubaufahrzeug tanks Nos. 3-5 kit, DML has now released a retooled version of Prototype No. 1. As with its larger brothers, the “Neubaufahrzeug” (new construction vehicle) – Nb Fz for short – vehicles used Rheinmetall developed hulls, first with a Rheinmetall rolled plate turret and then a faceted Krupp one. The first tank, Prototype No. 1, had rolled/welded Rheinmetall turrets for its “wing” machine guns and the main turret, as well as an awkward over/under arrangement of a 3.7 cm and 7.5 cm gun. This kit replaces some of the previous kit’s parts with the accurate components for mild steel prototype No. 1. As with its predecessor, slide molding eliminates a large number of parts and all of the etched brass. The entire upper hull and sponsons are molded as a single piece with many of their details in place, and it is a spectacular piece of work. The lower hull is actually a single piece belly and two running strips for the suspension units; however, here all of the bogies comprise a single unit with only the lead bogie wheel separate. Much of the kit’s design parallels the larger ones but wisely here the tracks are single piece DS Plastic runs. The two “wing” turrets consist of four new pieces each with closed hatches. But in this kit the commander’s hatch in the main turret is molded closed. It comes as a three-piece “dustbin” cupola but if you wish the hatch opened you will have to drill out the main hatch and make a new rotating flap from scratch. As with most recent DML kits, directions are provided for the DS Plastic tracks that indicate proper length for installation is 203mm. If too long, they recommend cutting; too short, stretching. I measured these as 197mm so stretching seems the new option. Two finishing options are provided: Unidentified Unit, 1938 (overall grey); and Unidentified Unit, 1938 (brown over grey). I would hazard a guess the first scheme is its rollout paint job and the second one is a propaganda photo op one. A tiny sheet of Cartograf crosses is provided. Overall 72ers are going enjoy “the other side of the story” with the Nb Fz and it should be a nice “bookend” to the first kit.